“Noises Off!,” a backstage farce by Michael Frayn, directed by Zachariah Stearn, 7 p.m. Thursday-Saturday, 2 p.m. Saturday-Sunday, Schoolhouse Arts Center, 16 Richville Road, Standish. Tickets $16 adults, $14 students and seniors, schoolhousearts.org. The Originals present “The Electric Baby” by Stephanie Zadravec, 7:30 p.m. April 18-20, 25-27 and 2:30 p.m. April 28; Saco River Theatre, 29 Salmon Falls Road, Bar Mills. Tickets: $25, seniors and students $22, pay-what you can. April 18 & 25. 929-5412 or www.sacorivertheatre.org. “The Foreigner,” comedy by Larry Shue, directed by Michael Boudewyns, University of Southern Maine Department of Theatre, Russell Hall, Gorham. Fridays & Saturdays 7:30 p.m. and April 20 & 28 2 p.m., April 24 5 p.m., April 26 10 a.m. Tickets $8-$16 at usm.maine.edu/theatre/foreigner. USM Jazz Ensemble, Chris Oberholtzer, director, 7:30 p.m. Corthell Concert Hall, Gorham. Tickets $8 adults, $5 students, seniors, USM employees, alumni at usm.maine.edu/music/. Visiting artists Transient Canvas, featuring electroacoustic music, 7:30 p.m. Corthell Concert Hall, USM, Gorham. Free. Jazz clarinetist Brad Terry joined by guitarist Peter Herman, 7:30 p.m., Village Coffeehouse, First Congregational Church Vestry, 19 Gloucester Hill Road, New Gloucester. Admission $10 at door. FMI: Julie Fralich, j.fralich@gmail.com or 653-4823. USM Vocal Jazz Ensembles, Taylor O’Donnell, director, 7:30 p.m., Corthell Concert Hall, Gorham campus. Tickets, $8 adults, $5 students, seniors, USM employees, alumni at usm.maine.edu/music/. Composers Showcase featuring USM Composers Ensemble, 8 p.m., Corthell Concert Hall, USM, Gorham. Free. Portland Ballet Co. presents “Classical Tribute,” sections of “Napoli,” “Romeo and Juliet” and “Don Quixote,” 7:30 p.m April 26, 2 p.m. April 27, Westbrook Performing Arts Center, 471 Stroudwater St., Westbrook. For more information and tickets, go to westbrookpac.org. University of Southern Maine BA & BFA Exhibition, Opening Reception, USM Art Gallery, 37 College Ave. Gorham. Gallery hours: noon to 6 p.m. Wednesday, Thursday; noon to 4 p.m. Friday-Sunday; and by appointment. 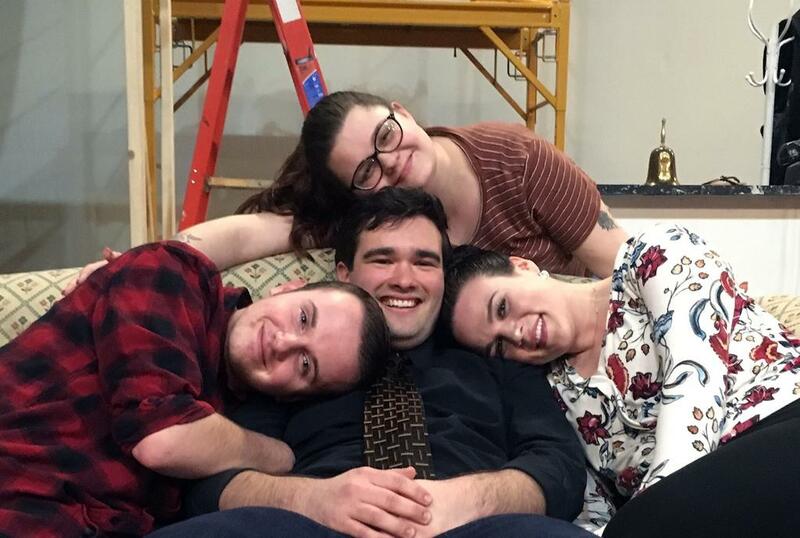 August Thornton, left, Drew Massey, Emma Zerba and Mariah Larocque appear in the comedy, “The Foreigner,” April 19-28 at Russell Hall on the Gorham campus of the University of Southern Maine.